When most people visit Washington, Seattle is the only stop on their itinerary. Some may venture south to see Mt. Rainier or north to check out Vancouver, but few people make plans to trek to the arid southeastern parts of the state. 14 Hands Winery wants to change that. 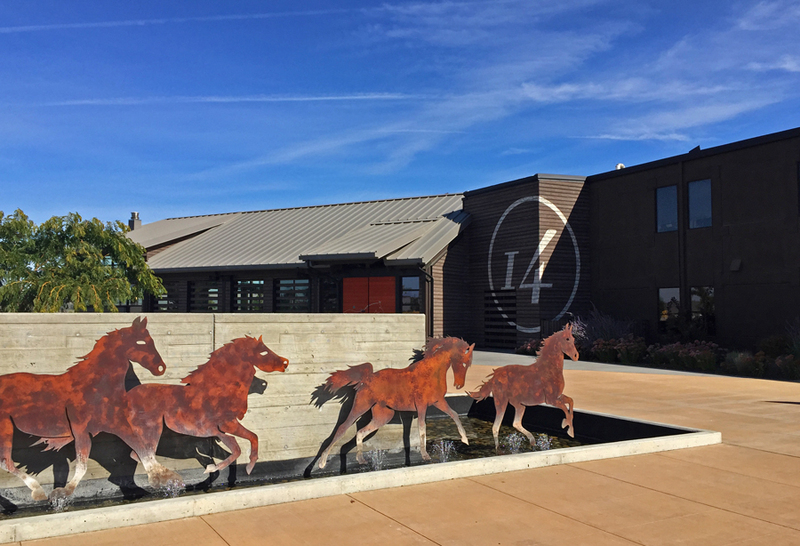 The small winery is located in Prosser, WA, nestled between the Horse Heaven Hills and the Yakima River. 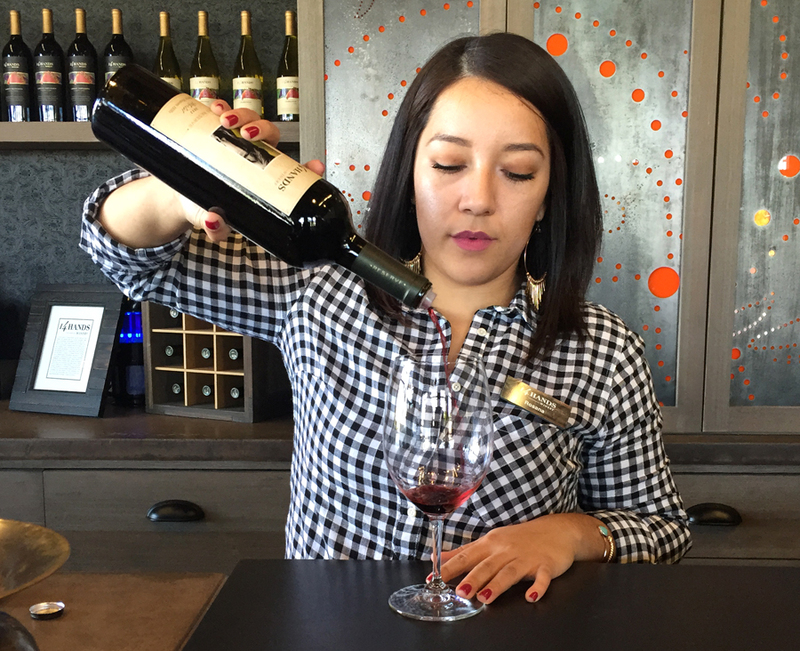 I visited 14 Hands on the first day of fall when wine enthusiasts start to transition from bright, crisp Riesling to bold, rich Cabernet. The first thing you notice when you arrive at 14 Hands is the giant mural on the building. The bright, colorful painting titled, “Wild Horses,” was created by Cynthia Sampson, an award-winning representational colorist who specializes in brightly colored pastel and acrylic animal paintings. “Wild Horses” is a striking and fluid piece of art that pays homage to the time when wild mustangs once freely roamed the hills of eastern Washington State. 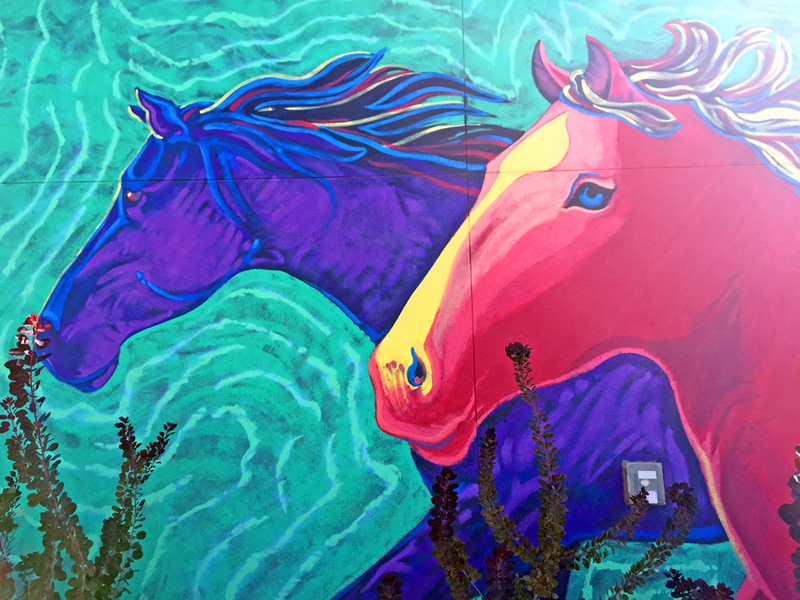 As I took in the beauty of the mural, I couldn’t help but wonder, “What do these horses have to do with wine?” As if she read my mind, Guest Services Representative Crystal Bowen, explained the significance. Bowen then directed us to the full-size bronze cutouts of the horses in front of the entrance. Bowen led us inside the building and the rustic, equine theme is continued throughout the interior. One of the winery’s most unique attributes is a beautiful display of reclaimed barn wood collected from barns in eastern Washington. The stories of these barns and the families who built them are also displayed throughout the winery. The interior reminded me of a modern lodge complete with indoor and outdoor seating areas, a unique barrel room, and a beautiful tasting bar. Lined along the wall behind the bar were dozens of 14 Hands wines. I couldn’t wait to start sampling a few. My first taste of 14 Hands wine was a new sparkling wine that the winery will start mass producing. It was light, fresh and fruity. I used it to create some mimosas to enjoy with the brunch that was waiting on us in the upstairs dining room. After a delicious meal, I headed back downstairs to try a few more wines. Bartender Rosana was waiting to fill my glass. I started with the Reserve Malbec. This wine opened with fruity aromas of ripe plums and black cherries and the ample acidity and supple tannins carried the flavors to a long, luscious finish. In other words, it was a rich, flavorful choice. I continued my tasting with a flight of Chardonnay, Merlot, Cabernet, and Hot to Trot Red Blend. Each wine had a unique character and personality. As I sipped the different varieties, Bowen shared an interesting fact. I must admit that I’m the type who would snub any wine that was sold at a gas station. However, 14 Hands Winery has changed my perception. I may have to give a closer look at the wines on the shelves of my local Exxon station. But the truth is that wine should be accessible. 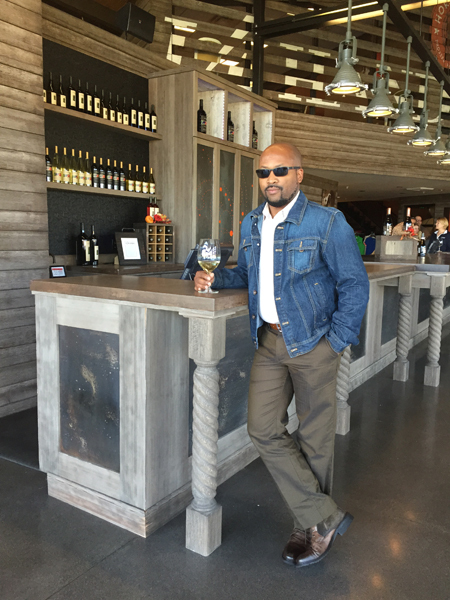 People should be able to get good wine at a convenience store or a five star restaurant. 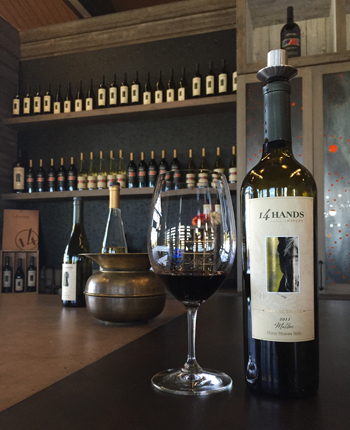 14 Hands does a great job of making wines that appeal to hoi polloi and the blue bloods alike. After tasting 14 Hand Winery’s varieties, I concur. We ended the visit by gathering on the patio to enjoy the cool breeze, drink a few more glasses of wine, and take in the beauty of the Washington landscape. The only that would have made it better would have been seeing a herd of wild horses dashing through the hills.